Are We Going To See More Supercharged Kawasakis This Year? After last year’s Kawasaki H2 and H2R, it’s hard to think that Kawasaki already have another supercharged bike up their sleeves, but Japanese magazine Young Machine seems to think otherwise. Please, please, please be right. Kawasaki registered the name “R2” with the US Patent and Trademark office (along with other, similar offices all over the world) back in 2013, which caused plenty of speculation when the H2 was announced. 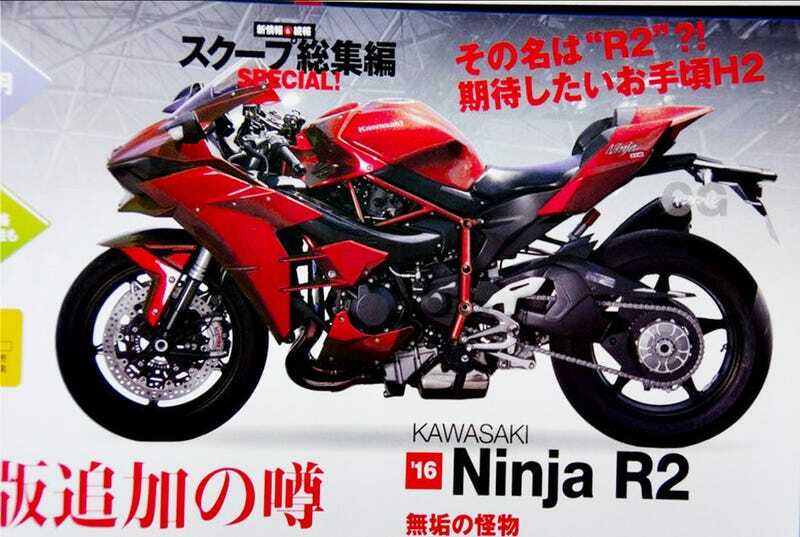 The rumors have pretty much subsided since then until this week, when Young Machine magazine claimed that the picture above was of a lower spec version of the H2, which Kawasaki are calling the R2. The same issue also featured this picture of a bike Young Machine is claiming is the Kawasaki S2, a supercharged 650 parallel twin. This would be extremely interesting, given Suzuki rumors about a turbocharged bike called the Recursion - and could even settle the turbo vs supercharged application for motorcycles once and for all. Young Machine magazine has had a hit or miss track record with their claims but, if they’re right, this certainly wouldn’t be the first time they broke a news story. A follow up bike to the H2 makes sense, as it would spread the development costs of producing a supercharged bike across several models. I just have a hard time thinking anyone is going to want a 1,000 cc supercharged motorcycle with cheaper components. The final piece of evidence is as anecdotal as it gets, but I was in Kawasaki this week to pick up a ZX-636 for a track day at Chuckwalla to test the ICON Airframe pro and, when the subject of their models releasing this year came up, the PR team all started giggling to themselves like my zipper was open. Take it for what you will, but I took it to mean 650 cc supercharged things and that 500 cc supermoto I’ve always dreamed about. Don’t judge me. We shouldn’t have to wait long to find out if this one is BS as Young Machine claim these two bikes are set for release at the end of the month at the Tokyo Motor Show.